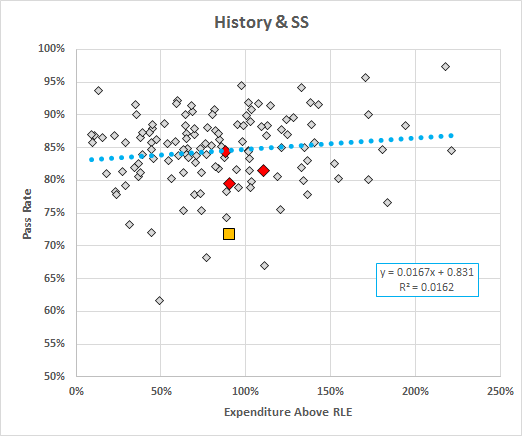 As we have seen, some Virginia school divisions spend a lot more than others but the spending does not correlate with SOL performance. 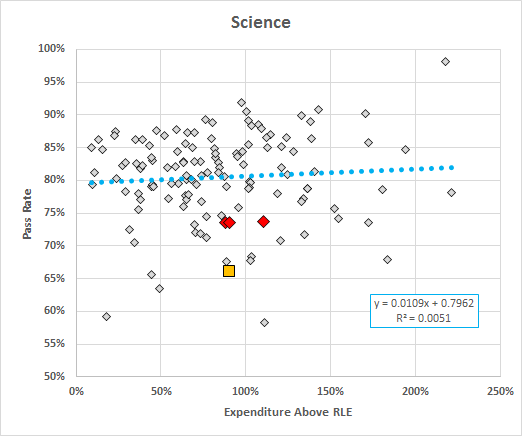 On the 2014 data, an analysis of the excess “expenditures and appropriations designated to meet [the] required local effort in support of the Standards of Quality” produced the same result. 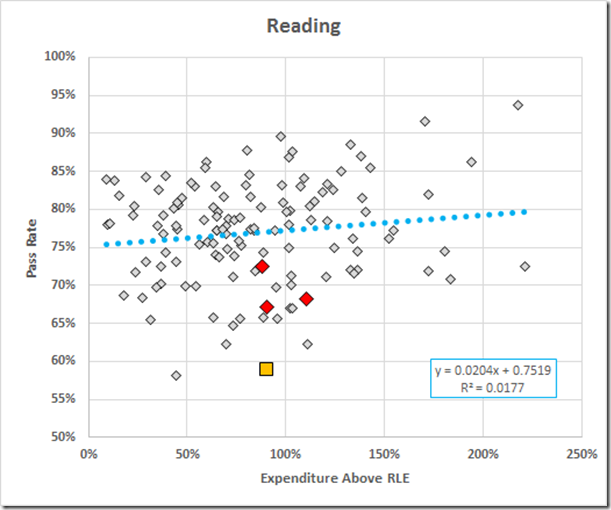 VDOE now has published the 2015 RLE data. 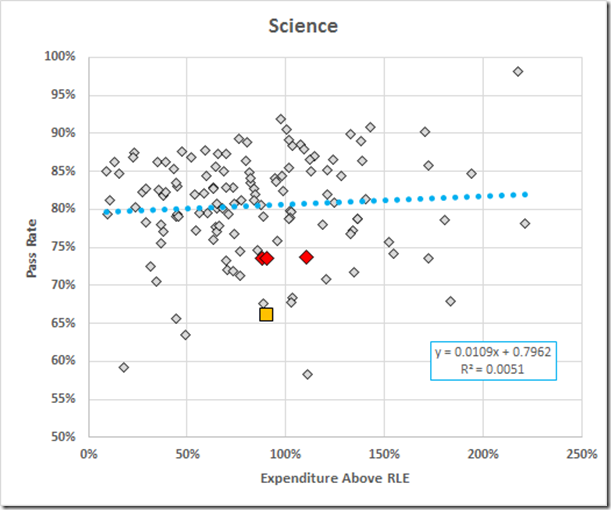 The estimable Jim Bacon yesterday posted an initial look at those data, which prompted me to take a more detailed look. 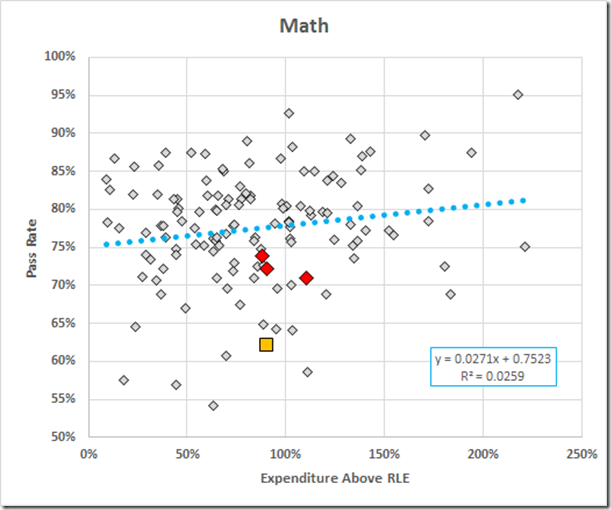 Note: Jim Weigand points out that these are 2014 RLE data, NOT 2015. Sigh. 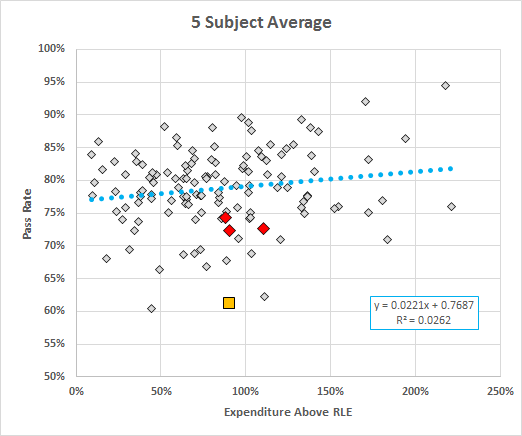 If I hadn’t screwed this up, I’d be wondering at length why it takes VDOE over a year and a half to post the ‘14 data. Details: Accomack is missing from the RLE report and is omitted here. 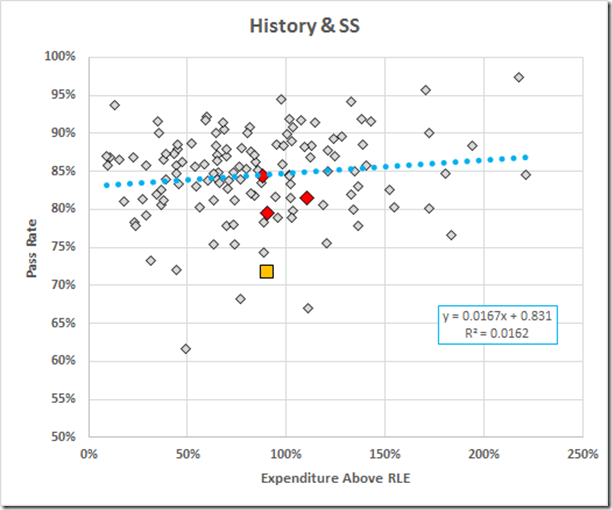 The RLE report shows separate data for Emporia and Greensville County, Fairfax City and County, and Williamsburg and James City County; the SOL data, however, combine those three pairs. 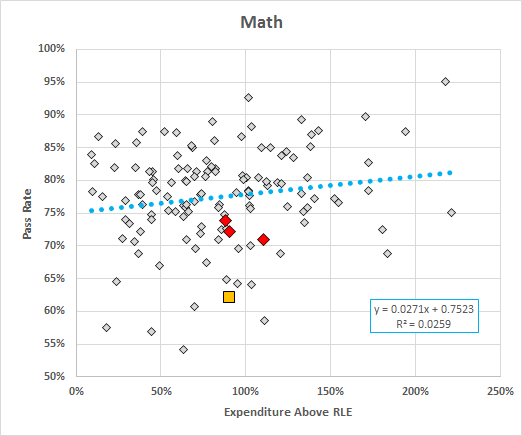 I have omitted Emporia, Greensville, Williamsburg, and JCC; Fairfax City and County have nearly the same RLE (about 129% excess each) and the County is large enough to swamp the City data in any case so I used the County RLE and City+County SOL pass rate. 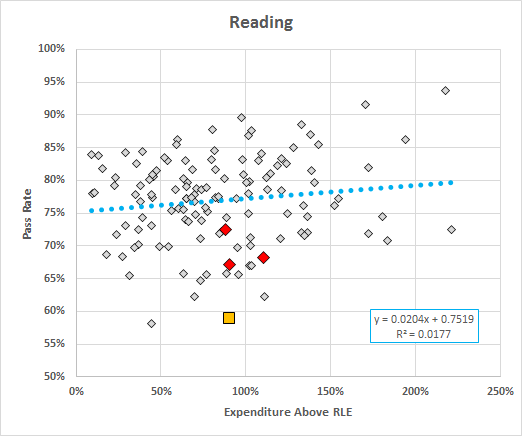 With those adjustments, here are the 2015 division reading pass rates vs. the 2015 local expenditures for operations above the RLE. 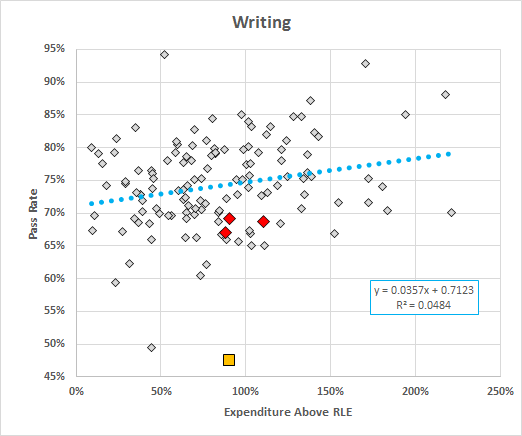 The fitted line suggests that tripling the RLE increases the pass rate by about 4% but the 1.8% R2 tells us that the pass rate and excess expenditure are essentially uncorrelated. Richmond is the gold square; from the left, the red diamonds are Hampton, Norfolk, and Newport News. The Big Spenders out there are Sussex (221% excess, 72% pass rate) and West Point (218%, 94%). 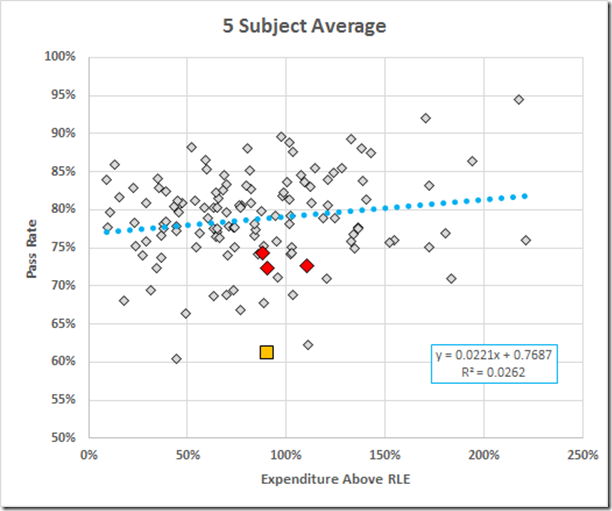 Here, with the omissions noted above, are the five subject data. 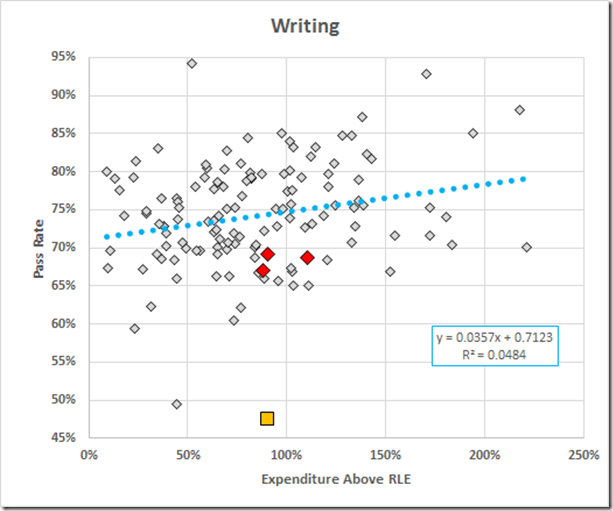 I made the lower case entries in the RLE list to force it to sort the same as the SOL list.